Isn’t that a great word? Doesn’t is just make you feel all warm and fuzzy inside? NO! Of course it doesn’t. 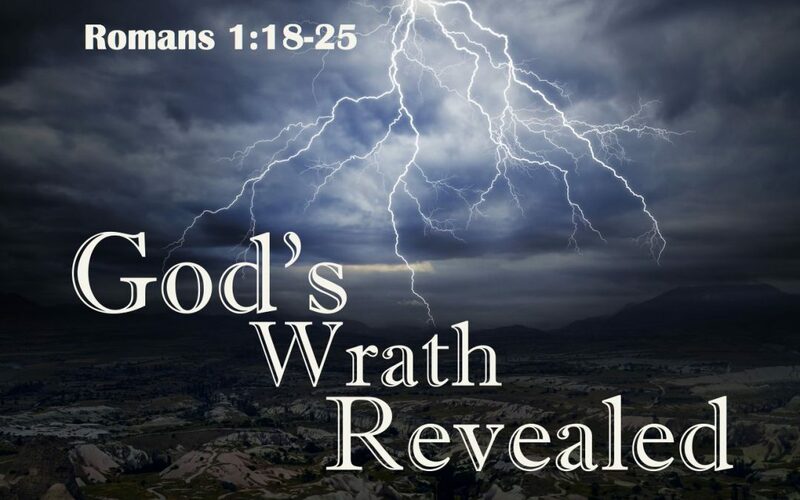 Wrath is not to be trifled with and certainly not the wrath of God. Many people are so discomforted by the word that they reject the idea outright. “God is love,” they say. “God isn’t going to condemn anybody. Especially those who have never had a law to follow or heard the gospel.” Well, yes, God is love. But God is holy, holy, holy as well. He is also a God of wrath and righteousness. Breaking His law demands retribution and punishment. Since God cannot be separated from His law, breaking it is a personal assault against Him personally. Paul’s point in Romans 1:18-20 is that everyone – everyone – has been given some law. Through God’s creation He has revealed Himself as Creator. Further, He has shown us His eternal power and divine nature. His expectation: that we simply acknowledge that He is God and we are not (thus honoring Him) and give Him thanks. Sounds simple enough and yet, we fail to do it. It’s on these grounds that we stand condemned before God, even though we may not have a written law from Him. Thus the excuse, “well, I never knew of God or what He expected” will never stand. Paul is presenting the cold reality that everyone has broken the law, especially those who have suppressed the truth. Not a great diagnosis but a necessary one to counter any excuses. Remember: first the bad news, then the good news.